The Boone Central/Newman Grove Cardinals concluded the 2014 Mid-State Conference volleyball tournament with a pair of consolation victories, then defeated Madison (25-19, 25-18, 25-19) to open play in the C1-8 Sub-District at Norfolk High School Nov. 3. That was as far as the Cardinals could take it, however, as C1 #6 Stanton swept BC/NG 25-10, 25-12, 25-22 in the sub semi-finals. “We played a good game against Madison, executing well on serve receive and in attacking,” praised Cardinal Coach Susan Roberts. “We knew we needed to have good ball control and push the tempo of the match. “Against Stanton, unfortunately, we had one of our worst serve-receive performances of the season. That kept us from getting into a good flow offensively in the first two sets. “We turned things around in the third set and our attack had a more consistent opportunity to get going. We passed better, had more digs and just played more competitively than the first two sets. 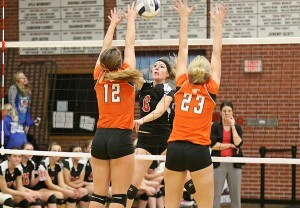 “I was proud of the girls for keeping their poise and turning it around in set three,” Roberts added.